Take care of your feet–and paws! Sometimes it just feels cooler to go outside with bare feet. If you have green grass, it may be tempting to let your toes try cooling off by walking out on that lawn. Or maybe kids want to run across the street to a friend’s house. And of course, the pup needs to be walked. But the National Weather Service Sacramento warns that going outside without foot protection could be hazardous to big and small feet alike. 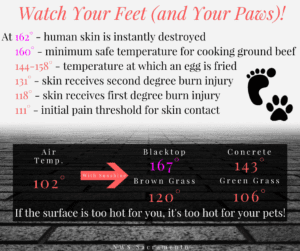 Rather than risking your skin, it’s a good idea to wear shoes, even if just sandals. Don’t forget your pooch! Give him or her some shoes or doggy booties too. Feet take us places. Let’s show ’em some love.